The Flyers haven’t had a youthful keystone starter in net since the early days of Ron Hextall. Part of the reason for this is that finding a young (capable) starting goaltender is much easier said than done and requires true dedication, via high, potentially risky draft picks or trade value. However, just declaring it a plan and priority is a refreshing change from the previous Philly goaltender philosophy of settling on scrap yard finds. This was present in the 2008 draft when the Flyers, armed with aging Marty Biron in net, passed over highly rated Swedish goaltender Jacob Markstrom, in order to acquire D–Steve Eminger from Washington with the 27th pick. Markstrom, primed to take over starting duties in Florida in the next couple years, is rated the No. 2 prospect not yet in the NHL in the latest Top Prospects edition of The Hockey News. Yet, as they say, the first step in recovery is admitting there is a problem. And the first key in acquiring a blue chip backstop is to understand the need followed by doing what it takes to snag the sometimes extremely expensive commodity. It appears the Flyers are ready to do what it takes. In his piece, SanFilippo cites potentially available goalies Antti Niemi (CHI), Carey Price (MTL) and Cory Schneider (VAN). But more viable options may be lingering below the surface. Los Angeles goalie Jonathan Bernier, who was drafted 11th overall in 2006, was once primed as the future net presence for the Kings. However, with the sudden emergence of Jonathan Quick, 21-year-old Bernier has played just one NHL game this season, an impressive win 2-1 win over Dallas. The 5’11 backstop logged most of his time in the AHL this year, where in 56 games he holds a very respectable 2.07 GAA and .936% sv pct. But what makes Bernier so appealing is the fact that he could be had. The Kings’ playoff window is opening and they could be looking to take on one of the Flyers’ multi-year contracts if it means winning a few playoff rounds in the upcoming seasons. Add in the fact that LA coach Terry Murray and assistant general manager Hextall are familiar with the Flyers roster and suddenly the wheels are greased for a deal to be made. 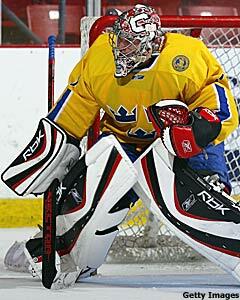 Another potential tender is 21-year-old Buffalo prospect and 2006 second round pick Jhonas Enroth. With Ryan Miller commanding the net for the Sabres for years to come, goalie prospects could be up for sale if the price is right. Enroth, a tiny goalie at a generous 5’10 has impressed this year with the Portland Pirates, posting a goals against of 2.37 and a sv pct of .919% in 48 games. He relies on quickness and solid positioning and has the uncanny ability to steal wins for his team. The downside to Enroth is that he could prove to be expensive. Likely not interested in taking on major money, Buffalo is expected to seek a first round pick or first round value for the goalie.